Left to right: Ann Gorrin, of Volunteer Delaware 50+ program Sussex County; Joanne Spink, a member of the Advisory Council of Volunteer Delaware 50+ Sussex County and member of Lord Baltimore Women’s Club; are joined by LWBC president Barbara Sundlin at the group’s October meeting. 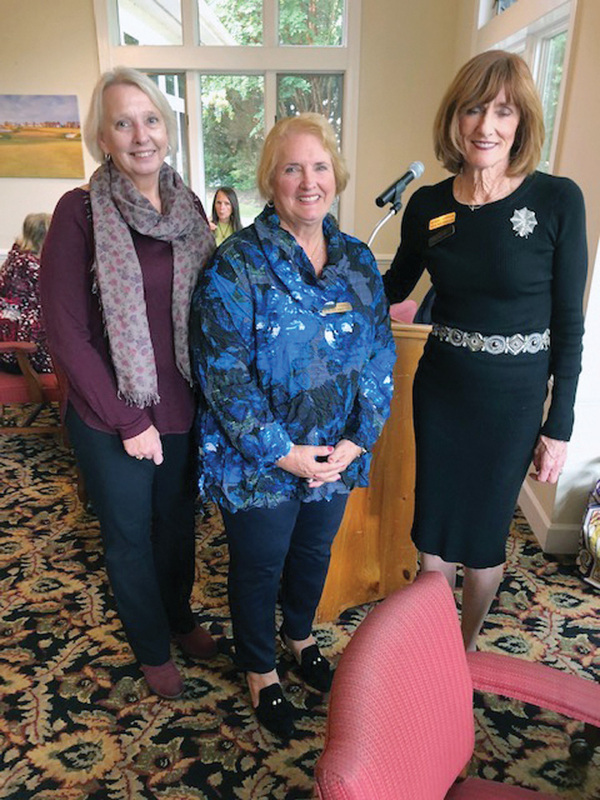 Connecting with the community through volunteering was the focus of the October meeting of the Lord Baltimore Women’s Club, held at Cripple Creek Country Club. The keynote speaker, Ann Gorrin head of the Volunteer Delaware 50+ program in Sussex County, provided an overview of the critical roles played by volunteers across the county. A state program, Volunteer Delaware 50+ partners with more than 100 non-profit organization across the county by connecting experienced volunteers (50 or older) with opportunities that match their interests and skill sets with community needs. Gorrin used a variety of everyday items to represent the breadth and depth of the ways in which volunteers contribute to the social fabric of lower Delaware: car keys (programs to drive older individuals to appointments), a dictionary (literacy programs working with schools), a ball of yarn (the Nimble Fingers program that produced almost 4,000 handmade items last year for hospitals, nursing homes and shelters), a can of dog food (Brandywine SPCA and Paws for People, bringing animals to visit the elderly and/or homebound), a can of food (assisting the local food banks), a hammer (Habitat for Humanity) and a children’s book (Read Aloud Delaware and student mentoring programs). Members shared their experiences with volunteering, expressing how meaningful it is to connect with a new person in the community, be it a child or an older person. Volunteer Delaware 50+ can match interests, skill sets and schedule with community opportunities at www.volunteerdelaware.org/volunteer-delaware50, or call (302) 515-3020. Promoting community volunteer opportunities is another example of how the Lord Baltimore Women’s Club connects to and supports the area. The more than 100 members of the club raise funds for local projects — for example, awarding $10,000 in scholarships to five local graduates last year, and volunteer in diverse programs, including Meals on Wheels, a local food pantry and Clothing for Kids. Find out more on the group’s Facebook page.